Dover International Speedway (formerly Dover Downs International Speedway) is a race track in Dover, Delaware, United States. Since opening in 1969, it has held at least two NASCAR races each year. In addition to NASCAR, the track also hosted USAC and the Indy Racing League. The track features one layout, a 1 mile (1.6 km) concrete oval, with 24° banking in the turns and 9° banking on the straights. The speedway is owned and operated by Dover Motorsports. In 1966, Melvin L. Joseph Construction Company, Inc. began construction on Dover Downs International Speedway, which was specialized for horse racing and auto racing. The race track was completed three years later, and would have its first race on July 6, 1969. The inaugural race, known as the Mason-Dixon 300, was won by Richard Petty. During the 1971 racing season, the speedway removed all the events not sanctioned by NASCAR to help keep focus on the two NASCAR Winston Cup Series races, which were 500 miles each. Eleven years later, Dover Downs International Speedway added a NASCAR Budweiser Late Model Sportsman Series (now Xfinity Series) event, the Sportsman 200. In 1986, the speedway added 3,200 seats to its 10,333 seat grandstand. Dover Downs International Speedway continued adding seats each year until 2001. A second Xfinity Series race was also added to the speedway's schedule during the 1986 season. Eight years later, Delaware General Assembly passed legislation to allow slot machines at pari-mutuel horse racing venues. In 1995 Dover Downs International Speedway replaced its asphalt surface with concrete, making it the second NASCAR Cup Series track after Bristol Motor Speedway to have a racing surface completely composed of concrete. During the same year, Dover Downs slots opened on December 29. Two years later, the speedway changed the race distances of its Monster Energy NASCAR Cup Series races to 400 miles, beginning with the 1997 fall race. In 1998, Dover Downs International Speedway added an Indy Racing League event to the schedule, but after two seasons the race was removed after the 1999 season. During the 2000 racing season, Dover Downs International Speedway added a NASCAR Craftsman Truck Series (now NASCAR Gander Outdoors Truck Series) event. Kurt Busch won the inaugural Truck Series race from the pole position. In the following year, the speedway's capacity was expanded to 135,000 seats, the largest of any mid-Atlantic sport's stadium. After the gaming side of Dover Downs separated, Dover Motorsports, Inc. was created to operate the speedway, which caused the speedway to become Dover International Speedway in 2002. Two years later, the speedway announced the completion of the Monster Bridge, which is a glass-enclosed structure that has 56 seats over the third turn, and its fall NASCAR Cup Series race became the second race in the newly formed, NASCAR Chase for the Championship. 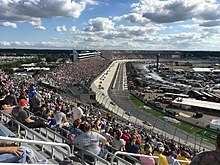 On May 26, 2006, Dover International Speedway announced a multi-year capital improvement project called "The Monster Makeover", which would begin after the speedway's June NASCAR Cup Series race. During the first stage of the improvement project in 2007, the speedway built a new 12-suite skybox complex and a new 2,100 square feet addition to the media center in the infield. Other improvements included widened walkways behind three grandstands, renovated restrooms, more paved handicapped parking areas, expanded bus parking, as well as a sound system with improved audio quality for the grandstands. In 2008, the second stage of the "Monster Makeover" took place. During the stage, the Monster Monument, a 46-feet tall fiberglass structure, was built in the new Victory Plaza, the FanZone area was expanded, and an emergency services building was built. One year later, the speedway continued the improvement project by replacing the front stretch pit wall to install a longer SAFER barrier wall that would make a wider and safer pit road, as well as an additional pit stall. On December 30, 2011, Dover International Speedway announced that they will replace the 18 inch wide seats in the grandstands with 22 inch wide ones, reducing the capacity from 140,000 to 113,000 over the next two years. Shortly after the 2014 AAA 400, Dover International Speedway began removing 17,500 seats in turns 2 and 3 as a result of declining attendance, reducing the track's capacity to 95,500. The removal of the seats was completed by Christmas 2014. Also after the 2014 AAA 400, the track began work on a $2.9 million project to install a new catchfence that was ready for the 2015 season. The new catchfence is 21 feet (6.4 m) high, as opposed to the old catchfence, which was 15 feet (4.6 m) high. In 2016, Dover International Speedway added 479 feet of SAFER barriers along the backstretch and turn three, and reduced the number of pit stalls available by increasing each stall by two feet. ^ a b c d e f "Dover Downs International Speedway Construction Begins". Joseph Frederick & Sons. Archived from the original on October 29, 2012. Retrieved May 31, 2012. ^ a b "The Melvin L. Joseph Construction Company, Inc". Melvin L. Joseph Construction Company, Inc. Retrieved May 31, 2012. ^ "Dover International Speedway Track Specifications". Dover International Speedway. Retrieved May 31, 2012. ^ a b "1969 Delaware 200". Racing-reference.info. Retrieved May 31, 2012. ^ a b c d e f g h i j k l m n o p "History Highlights". Dover International Speedway. Retrieved May 31, 2012. ^ McKee, Sandra (July 18, 1998). "Dressed-up Dover Downs welcomes Indy cars 107,000 seats overlook tricky one-mile oval". Sun Staff. Dover, Delaware. The Baltimore Sun. Retrieved May 31, 2012. ^ "INDYCAR: IRL: IRL 2000 Schedule Announced". Motorsport.com. November 2, 1999. Retrieved May 31, 2012. ^ "Dover plans massive improvement project". Autostock. NASCAR. May 26, 2006. Retrieved May 31, 2012. ^ a b "Dover in first phase of Monster Makeover". Official Release. NASCAR. February 28, 2007. Retrieved May 31, 2012. ^ "Monster of a structure: Monument set for Dover". Track Release. NASCAR. January 26, 2008. Retrieved May 31, 2012. ^ "Third phase of construction at Dover track under way". Track Release. NASCAR. January 8, 2009. Retrieved May 31, 2012. ^ "SAFER installation ends Dover renovation project". Official Release. NASCAR. May 15, 2009. Retrieved May 31, 2012. ^ "Dover International Speedway announces seat-widening plan to begin in 2012". Doverspeedway.com. December 30, 2011. Retrieved December 30, 2011. ^ Offredo, Jon (October 15, 2014). "Dover International Speedway trims seating". The News Journal. Wilmington, DE: Gannett. Retrieved October 16, 2014. ^ "Dover installing new catch fence". ESPN. Associated Press. September 29, 2014. Retrieved October 16, 2014. ^ "Dover International Speedway Extends SAFER Barriers". Motor Racing Network. May 9, 2016. Retrieved May 10, 2016. ^ a b "Miles the Monster". RoadsideAmerica.com. Retrieved May 31, 2012. ^ "Unique trophies in NASCR". NASCAR. September 25, 2014. Retrieved April 26, 2018. ^ "Stewart says Dover not such a monster". Associated Press. The Augusta Chronicle. July 17, 1998. Retrieved May 31, 2012. ^ "2012 NASCAR Schedule". Dover International Speedway. Retrieved May 31, 2012. ^ "Dover International Speedway Track Records". Dover International Speedway. Retrieved May 31, 2012. ^ "Dover International Speedway Track News". Jayski's NASCAR Silly Season Site. Retrieved June 1, 2012. ^ "1998 Pep Boys 400K". Racing-reference.info. Retrieved May 31, 2012. ^ "1999 MBNA Mid-Atlantic 200". Racing-reference.info. Retrieved May 31, 2012. Wikimedia Commons has media related to Dover International Speedway.